FOUR SHARK ATTACKS IN TWO WEEKS: NEW SMYRNA BEACH!!! 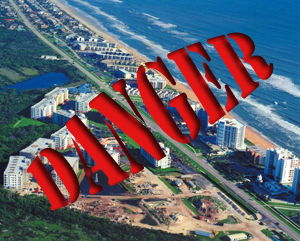 You are here: Home / News / FOUR SHARK ATTACKS IN TWO WEEKS: NEW SMYRNA BEACH!!! An off-duty 19-year-old lifeguard was bitten on the foot Thursday by a shark in the waters off New Smyrna Beach, officials said. Thomas Gold was surfing when he was bitten on his left foot, said Scott Petersohn of Volusia County Beach Patrol. Gold suffered minor injuries and was treated on the beach, Petersohn said. The incident took place in the same area where a shark attack occurred on Wednesday, Petersohn said. Gold has worked as a lifeguard with Beach Patrol since the beginning of summer, Petersohn said. The bite marks the 19th shark attack in Volusia County in 2008. Absolutely Incredible!!! The terror continues on the Florida Coast with little fanfare or concern for beach-goers. Four attacks in two weeks in California? There would be total chaos. Mass insanity. Why such apathy on the East Coast? When sharks attack your beach users every week, do you simply get used to it? Is there a shark in New Smyrna Beach that has developed a taste for human blood!? !